From time to time it’s worthwhile to take a look back at the products we use most often and like best and ask ourselves, “Why is this product working for me when others didn’t?” A prime example of that–to me–is the Cloudveil Hellroaring softshell jacket ($200). Cloudveil came into the fly-fishing market in 2005 with a strong background in the ski market. The Jackson, Wyoming based company built its reputation on the creative use of Schoeller Softshell fabrics. Softshell differs from Gore-Tex and other breathable materials in that it is not 100% waterproof. Rather, it is water-resistant, with a very high evaporation rate, meaning the cloth stays dry so long as the rain or snow falling on it doesn’t pass your body heat’s ability to evaporate the water off of it. The Hellroaring jacket was announced last year. 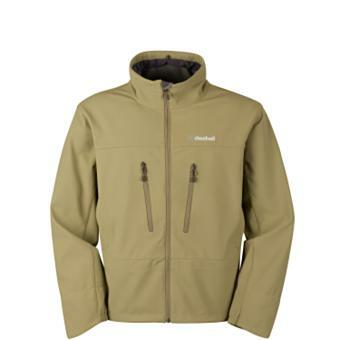 By my count it was the second softshell jacket to enter the fly-fishing market (after Sage‘s very successful 2007 Skagit River model, which won a number of awards, including an American Angler Ka-Ching! award in that year). The big problem, to me, with fly fishing clothing, is that practically every garment screams “fly fisherman!” With huge gusseted pockets for boxes, little hooded retractor holders, and rod-holding loops, the typical fly fishing shell is awesome for on-the-water use and not so good for wearing to a football game. Cloudveil essentially inverted these features with the Hellroaring coat: the pockets are large enough to hold a large CF Designs flybox, but they are on the inside, hidden. There’s a net-holding loop but no retractor holders. There is no hood. The cuffs are especially well-thought out. A tight, nylon-gasketed inner wrist cuff keeps wind gusts and water from rushing up sleeves, while a cosmetic outer cuff lets the sleek look of the sleeve run all the way over the wrist. Scallops on the ends of the sleeves take the softshell material over the back of your hand, which is great when wearing gloves to keep everything tucked properly. Also typical for Cloudveil, the main zipper is backwards, teeth-inwards, giving the front of the jacket a sleek look at no extra cost, and obviating the need for any kind of zipper-cover to keep fly line from catching on open teeth. Finally, the Softshell material itself is warm, comfortable, fashionable, stretchable, and in my experience more or less waterproof unless you’re standing in a downpour. It’s also machine-washable and has a lengthy DWR treatment coating. My one complaint is that the stretchiness of the fabric allows it to snag grit from tree bark, making long stains that have to be washed out whenever I go climbing through the rhododendron tunnels. All in all, it’s one of my favorite coats. Do you have a favorite fly fishing jacket? What do you like most about it? Let us know in the Comments section.